The Comedy Channel is adding Jimmy Kimmel Live to its line-up from late September. It will air at 6.30pm Tuesdays to Fridays, Express from the US, from September 22nd. The show was last on the Comedy channel in 2010 but was replaced by The Tonight Show with Jay Leno. The first week of shows will feature Kerry Washington, Don Johnson, Lea Michelle, and LL Cool J among others. Jimmy Kimmel is host and executive producer of Emmy® nominated Jimmy Kimmel Live. The late night talk show from ABC is known for its massive viral video successes including “Mean Tweets”, “Lie Witness News”, “Jimmy’s Twerk Fail Prank”, “Unnecessary Censorship”, “YouTube Challenge”, and more. 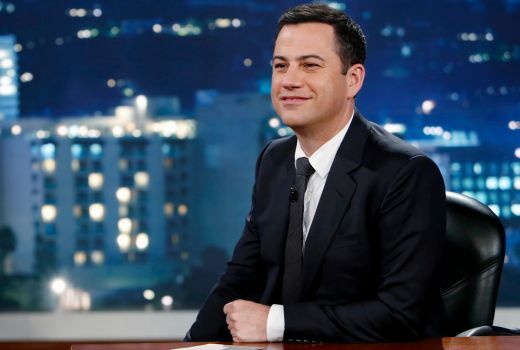 The hugely popular Jimmy Kimmel Live is now in its 13th season. Since 2003 Kimmel’s guests have included President Barack Obama, Johnny Depp, Meryl Streep, Tom Cruise, Harrison Ford, Jennifer Aniston, Will Ferrell, Tom Hanks, Amy Poehler and Matt Damon, as well as many more Hollywood stars, celebrities and entertainers. Kimmel himself is a natural born prankster which is reflected in the humour on his show. He loves hoaxes and pranks and pushes them further than most people do, not even drawing the line with his own staff. As a talk show host, Kimmel pushes the envelope and is not afraid to take risks when sending up popular culture, celebrities and A-Listers, and seemingly doesn’t have any boundaries. Good to see he will be returning.Certainly one of my favourites,leaves Fallon for dead. Conan is my next choice.I can now watch at least watch one of these shows now. That’s great news. I enjoyed the show last time it aired. Perhaps Comedy are regretting letting E! pick up Fallon. Had totally forgotten Kimmel had been on TCC, good to see him return. So are the Daily Show with Trevor Noah [starts sept 28] and the Nightly Show with Larry Wilmore moving to 5.30pm,7.30pm or being dumped ? Daily Show will be 10pm (see earlier post). I will try to collate a guide to these US chat shows later in the week, it’s probably worth a wider article now. Good buy by Comedy. They were in need of a late night show since dumping Fallon. If memory serves E!’s broadcast of Fallon finishes at 6:30pm so a good segway really. But unfortunately for them with Eleven having Colbert and Corden their choices were limited to either Kimmel or Meyers. But unfortunately that timeslot explains why Nightly with Noah got shoved to late night – but to me still seems like a bad idea.